The present study investigates the aqueous stability of polyethylene glycol and oleic acid- based anionic surfactants through the dynamic light scattering (DLS) and zeta potential methods, for application in enhanced oil recovery (EOR). Polyethylene glycol dioleate sulfonate (PDOS) surfactant solutions were prepared in concentrations of 0.05, 0.1, 0.3, 0.5, and 1 wt% in deionized water. Aqueous stability of PDOS was assessed by measuring the droplet size over five days, using nano particle analyzer HORIBA SZ-100 at 25oC. Results show that good aqueous stability of PDOS was achieved at concentrations of 0.1 to 1 wt%, but with the droplet size becoming unstable at the lowest concentration of 0.05 wt%. The polydispersity indices were classified into polydisperse distribution type recorded as 0.3 to 0.5 at concentrations of 0.05 and 0.1 wt% and 0.2 at concentrations of 0.3 to 1 wt%. The critical micelle concentration (CMC) of PDOS was 0.3% and the interfacial tension of PDOS surfactant above the CMC was around 10-3 dyn/cm. The zeta potential of PDOS surfactant without the addition of salt in concentrations of 0.05, 0.1, 0.3, 0.5, and 1 wt% was highly stable up to -96.8, -90.5, -89.6, -82.3, and -64.4 mV, respectively. With the addition of salt they were moderately stable at a concentration of 1 wt%. The conductivity increased with increasing concentration. The zeta potential of PDOS with the addition of salt was moderately stable in a concentration of 1%. Although PDOS with concentration of 0.05% showed a high value of zeta potential with the addition of salt, there is no guarantee that the PDOS surfactant solution will be stable for five days. Aqueous stability of PDOS surfactant for five days was observed in concentrations of 0.1 to 1 wt%, during which the droplet size became unstable from the third day at the lowest concentration (0.05 wt%). Polydispersity indices of PDOS at concentrations of 0.05 and 0.1% were 0.3 and 0.5, meanwhile at concentrations of 0.3 to 1 wt% polydispersity was measured as 0.2. The polydispersity index of PDOS classified it as being of a polydisperse distribution type. The CMC of PDOS was 0.3% and IFT of PDOS above the CMC was around 10-3 dyne/cm. 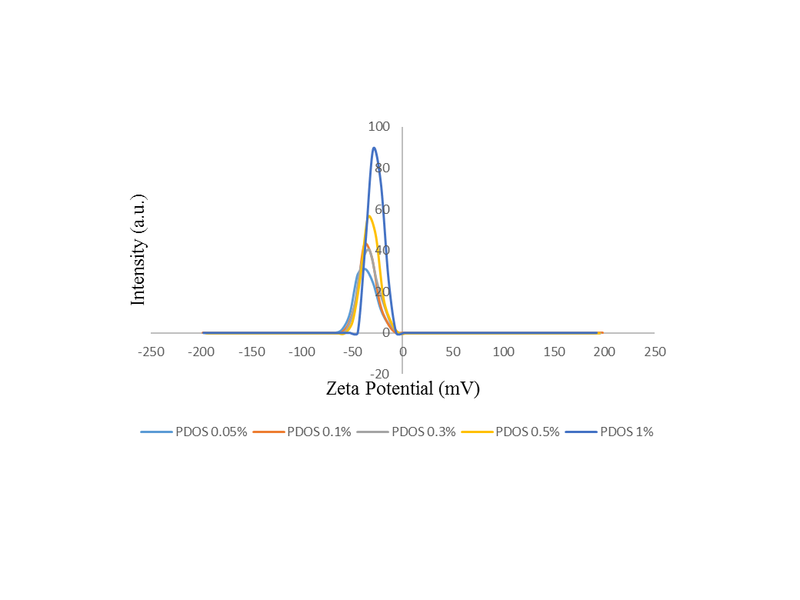 Results of the zeta potential of PDOS without the addition of salt at concentrations of 0.05, 0.1, 0.3, 0.5, and 1% were highly stable, being recorded as -96.8; -90.5, -89.6, -82.3, and -64.4 mV, respectively, and conductivity increased with increasing concentration. The zeta potential of PDOS with addition of salt was moderately stable at a concentration of 1%. Although PDOS with concentration of 0.05% demonstrated a high value of zeta potential with the addition of salt, there is no guarantee that the PDOS surfactant solution would be stable for five days. The authors thank Ir. Letty Brioletty M.T from PPPTMGB LEMIGAS as a partner in the application of this study of polymeric surfactants in EOR, and Dr. Eng Agus Haryono as the Director of the Research Center for Chemistry LIPI. The financial support received from DIPA is fully acknowledged. Irawan, Y., Juliana, I., Adilina, I.B., 2017. Synthesis and Characterization of Palm Oil and Polyethylene Glycol Based Polymeric Surfactants. The 4th Bali International Seminar on Science and Technology (BISSTECH) and The 1st International Joint Conference on Science and Technology (IJCST).